I recently read an article claiming to be a case study that it was somehow the French hyperinflation that led to the revolution. It seems that as you say they are again mixing facts to support a rise in gold with hyperinflation. 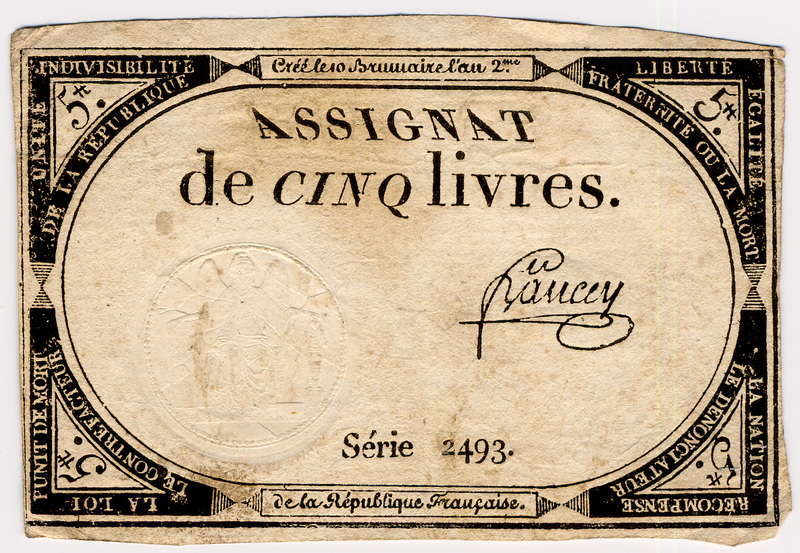 I am a collector of French monetary history and the paper money came after the revolution not before. Unquestionably, there was austerity prior to the revolution and that seems to be repeating in Europe. Would you care to comment on this issue for it seems they are distorting history once again to sell gold. Your debut here in Paris was super. It has really made some impact starting a discussion. ANSWER: Yes, you are correct. 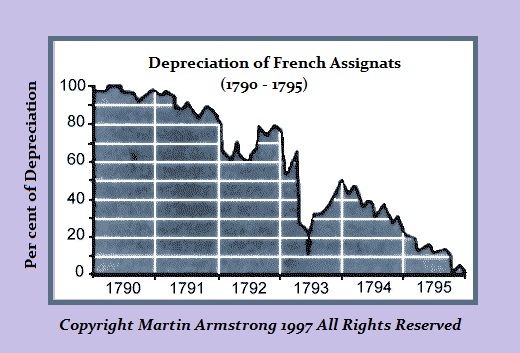 The French hyperinflation came after the French Revolution because they defaulted on their national debts accumulated by the crown and then confiscated the property of the Catholic Church to try to back their post-revolutionary currency. The nation went into hyperinflation because the revolution defaulted on all prior debt. They hunted the rich, took everything they had, and even beheaded them. This was not an atmosphere that promoted CONFIDENCE. Some people try to claim that hyperinflation is caused by paper money rather than revolution that results in hunting the rich. The German hyperinflation followed the same sequence; the Communist Revolution in 1918 also defaulted on the national debt of the prior government. The default, not paper money, distinguishes both hyperinflation events because CONFIDENCE simply collapsed and the economy imploded. By attributing this to “fiat” paper, they then assume that we must go into hyperinflation simply because we too have paper money. That is an unsupported analysis that distorts the entire sequence of events. This analysis is highly dangerous and amounts to consumer fraud. 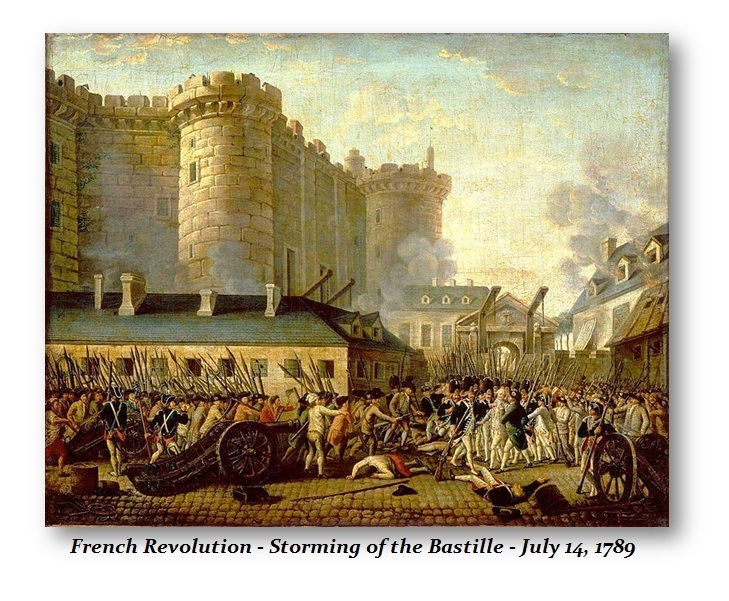 The French Revolution erupted because of taxes and AUSTERITY. The debt default and hunting the rich (which destroyed the economy) was a revolutionary reaction. When nobody will do business, they hoard cash, and everything implodes. The hyperinflation began instantaneously with the new revolutionary government. We have had a paper money system in the USA federally since 1863. There is no comparison. This is like saying do not eat a carrot since everyone who has ever eaten one has eventually died. 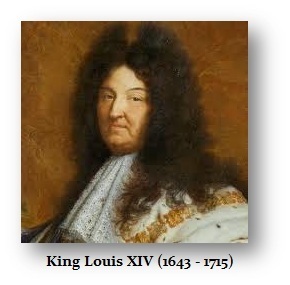 Under Louis XIV, the Royal French debt rose due to war. On his deathbed, Louis XIV said he feared that he had loved war too much. We have the same problem today with the bureaucrats deeply involved in the military establishment who are bred with the single focus of war. They see war behind everything; every word is analyzed within the framework of war. The 1720 French Mississippi Bubble is typically overlooked, but it was this event that set the debt in motion that accumulated and lead to the French Revolution. 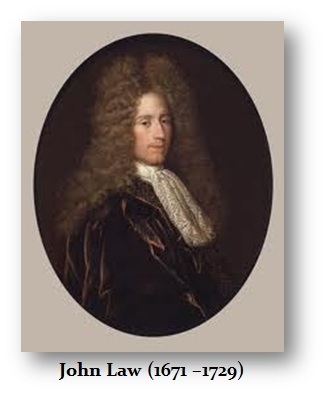 The financial crisis of 1720 was one of the first major banking bailouts in history. A few months later, that financial crisis was a contagion that spread to London and unfolded there as the South Sea Bubble. The collapse of the Mississippi Bubble became a political event because it had attracted capital from around Europe. When the bank failed, the French government guaranteed all the losses. That set in motion the AUSTERITY that followed. It had nothing to do with fiat; AUSTERITY was created by raising taxes to support the debt which collapsed the French economy. The Mississippi Bubble led to the government raising taxes to cover the cost of the bailout since the experiment that was set in motion by John Law was usurped by government and distorted by corrupt government officials necessitating the bailout. The French Revolution was caused by AUSTERITY and tax increases that created a shrinking economy. Raising taxes to pay debts always leads to revolution. This is why the American Revolution prohibited direct taxation and Jefferson stood against a national debt. The French hyperinflation was not the CAUSE, but the result of the revolution. Hyperinflation unfolds when there is a collapse in CONFIDENCE in government. Unable to tax, unable to borrow, governments irresponsibly print money, but it is the lack of CONFIDENCE (trust) that creates the hyperinflation. The rich hoard, do not invest, and withdraw all funds from banks, which sends unemployment soaring until the economy collapses. A collapse in CONFIDENCE leads to hyperinflation, not the mere fact that it is fiat money since all money is fiat. In China and Japan, money was always fiat. There was no tangible value. The value was simply declared by the Emperor who was considered to be the hand of God. 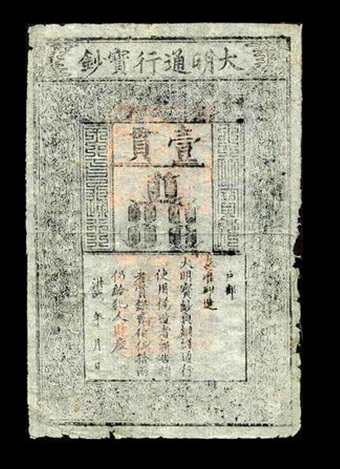 China was the first to issue formal paper money. 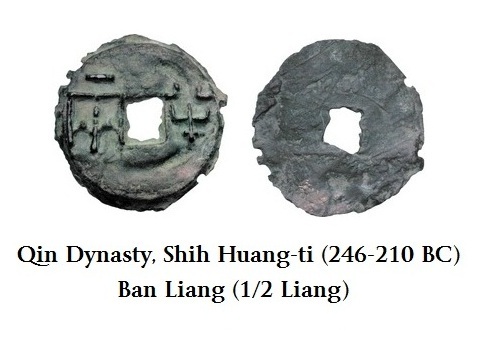 Even when the Mongols conquered China, they retained the paper money in circulation so it did not depreciate nor did it move into hyperinflation. Since the emperor was assumed to be God’s representative on Earth, that meant that God must have sanctioned the conquest by the Mongols and thus CONFIDENCE was not destroyed. If fiat alone causes hyperinflation, then China, as well as our own current monetary system, should have collapsed in 1971 and the world should not function at all. So there is something more to this simple one to one relationship. The ancient Egyptians never used coins and money was effectively receipts for grain. They did not issue coins until they were conquered by Alexander the Great. They had the longest paper money system in history for more than a thousand years. It is unfortunate, but these people draw erroneous conclusions simply because of the existence of paper money which prevents them from understanding what really is money to begin with. It seems that society cannot handle complexity and always tries to reduce it to a single cause and effect. Therein lies the confusion since nothing is a single cause but always complexity. Austerity is always the precursor to revolution. Hyperinflation is the effect of revolution, not paper money. Before the American Revolution, King George III imposed taxation to pay for wars and demanded payment in gold and silver; whatever trade flowed from Britain to America was paid in copper. The King knew that Americans could get silver and gold from trading with the Spanish. This extraction of taxation depleted the money supply and led to the introduction of paper money — the shortage of coinage. 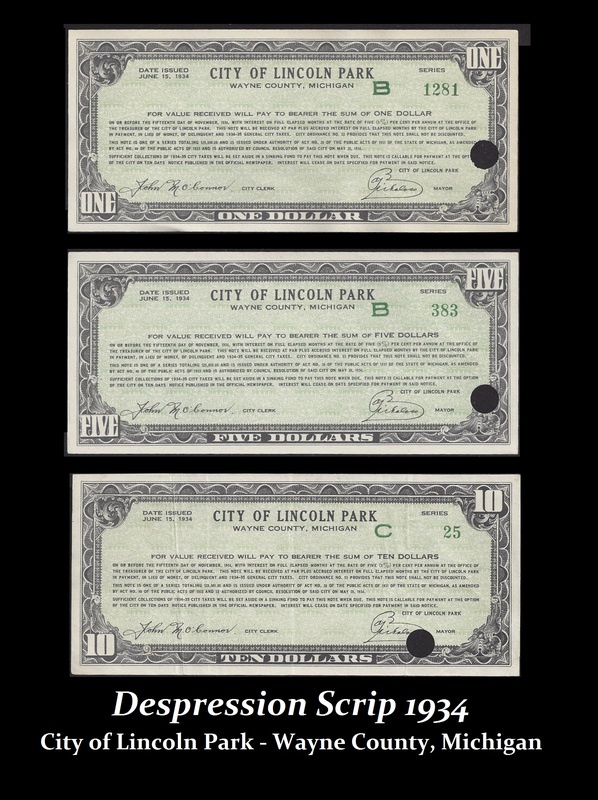 During the 1930s, the austerity nearly led to revolution when more than 200 cities began issuing their own paper money due to the lack of coinage. This did not lead to hyperinflation. There is more to this than just blaming paper money and concluding that we will see hyperinflation without comprehending the real causes. A lack of in-depth research produces this nonsense all because biased promoters want to make a sale and act only in their self-interest. This is serious stuff. Distorting history in such a manner to make money is a ruthless disregard for society. People will lose their lives because others lack the research, blame paper money, and ignore the precursor: AUSTERITY.